It is unclear whether they were staying in Devon or Cornwall, as highlights of both counties feature in the narrative. 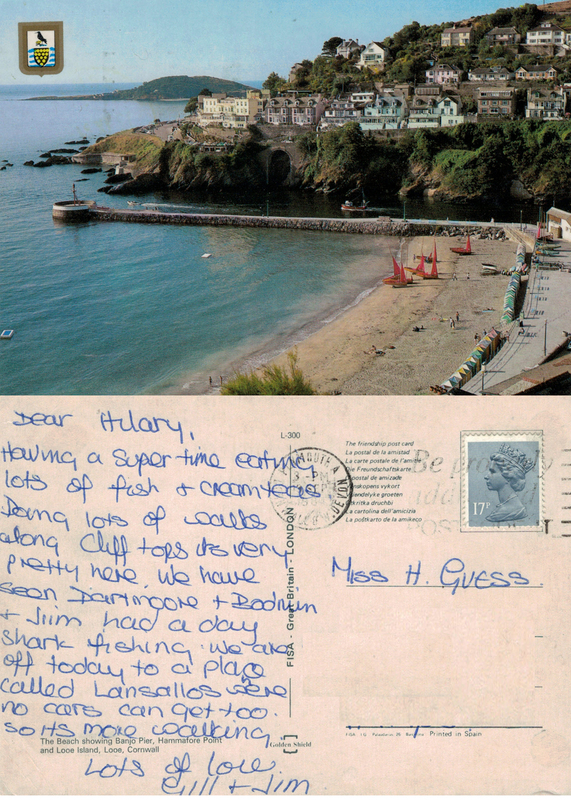 The picture on the front is Looe, Cornwall, which continues to be a very popular tourist destination. Lansallos beach, mentioned, remains relatively inaccessible today, as do many of the hidden coves around the Cornish coastline. This entry was posted in Correspondence, Deltiology, Friendship, Life Path and tagged Catching up, Cornwall, good news, Lansallos, Looe, Plymouth, postcards, reunions, status updates. Bookmark the permalink. I really enjoy these, each one is a story!